Tawny, one of our readers from Brantford, Ontario, sent us these pictures of birds that she has seen and would like help to identify - I need to know the name of this bird - we have taken plenty of pictures, but I just need to know where to send them ... we love watching them. They are here every year too, eat berries, and their sound is very high pitched. 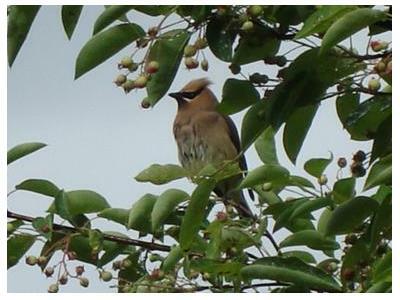 Hi Tawny, thanks for your pictures - I think those birds are Cedar Waxwings. Here is a link to more information about the Cedar Waxwing and the similar species, the Bohemian Waxwing. Comments for Name that bird! We built a beautiful small pond/waterfall a few years ago. 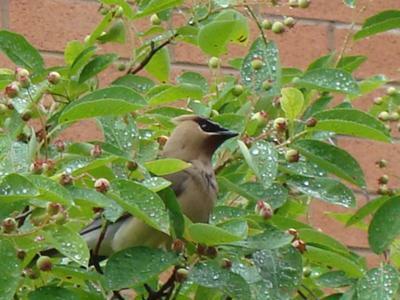 The first year we started to see a flock of the Cedar waxwings visiting the waterfalls. At the time I didn't know the name of the birds but with the internet it didn't take long. They come each season and always in a flock, they stay for a few weeks and then they are gone again till next season. We live in the country and it is amazing to see them and they are quite entertaining to watch them at the waterfall. A very beautiful bird. It is a Cedar Waxwing. We would get them eating the mulberries from the tree in our yard. When they eat too many rotten ones, they would get drunk and not be able to fly for a while or they where just too full. I have a little tree with red berries and one was eating the berries from that tree. We were at a sanctuary where 6 or 7 Cedar Waxwings were playing with each other, then one had a berry and they all landed on one branch and handed it down the line back and forth to one another. As we walked the trail they followed us crossing our path landing by us and just playing. Hi there, we are new to the area and have seen these birds in our backyard. I have taken several pictures of them. They have a peaked head much like a cardinal but are brown in colour. I love seeing the different birds and eager to attract. Never seen or heard of a Cedar Waxing before (sheltered life?). Been living in London for 3 years and still never heard of, or seen a Cedar Waxing until this year when a group started feeding on a berry producing tree in my front yard. This was the first time they'd been in my area. Fun and active bird. A Cedar Waxwing most likely. The Cedar Waxwing has a white under-tail which is easily seen when perching, the Bohemian Waxwing has a rufous (reddish brown) under-tail. They are primarily a norther resident but sometimes stop in this area on their migration. Cedar Waxwings are real comedians. They will play with you if they are in the mood. We were in Port Burwell last summer at the bird sanctuary and 6 - 7 of them followed us, flying back and forth across the path in front of us and behind us. It was funny to see and to be a part of. They were also feeding one another, sitting in a row, passing food down the line back and forth until some one finally ate it. They are a fun bird. Yup, they are Cedar Waxwings. They are usually seen around dense hedges and wooded ereas and love berries. Enjoy, they show up every Spring in my back garden. I study bird books for fun, and I am 99% sure that that is a Cedar Waxwing. I believe that would be a Cedar Waxwing in Brantford in the Spring / Summer months - it is unlikely to be a Bohemian Waxwing this far south at this time of year. We used to have a Mountain Ash tree when we lived in Northern Ontario, and the Cedar Waxwings loved those berries! A whole flock of them would land in the tree and eat all the berries. I haven't seen them in the London area, but we used to see them all the time in Timmins. They are a beautiful bird and I wish we saw them down here.